Grigori Rasputin (1869-1916) was a peasant-turned-monk who held much power in Russia just prior to the communist revolution, until he was murdered by nobles. Once World War I broke out, Czar Nicholas II moved to the front lines and left his wife, Czarina (Tsarina) Alexandra, in charge of running the country. Alexis, heir to the throne, was born with the genetic disorder known as hemophilia, which means blood has difficult clotting. A small cut just bleeds and bleeds in a frightful manner. His mother, the czarina, understandably was fraught with worry about his condition. She increasingly relied on the only person who seemed able to stop her son's bleeding: a peasant-turned-monk named Rasputin. Rasputin took advantage of this trust and began making decisions for the country, granting government positions to friends, and causing everyone (especially the nobles) to fear him. Rasputin had a mystical quality that has inspired many books and stories about him. 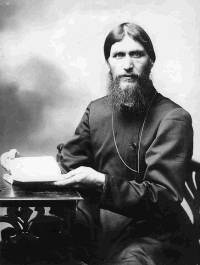 Rasputin underwent a religious conversion at the turn of the century after claiming to have visions of the Virgin Mary and when everyone else failed to help the boy's bleeding disorder, Rasputin claimed healing powers that would help. He was sometimes referred to as the "mad monk". Whatever he did seemed to work, though historians still debate if and how he really stopped the bleeding. Regardless, the nobles hated Rasputin because he was a peasant who now had power over them, and the nobles plotted to assassinate him. The method of choice for assassination was poison. The nobles laced some pastries with enough poison to immediately kill a horse, and many times more what was necessary to kill a human immediately. Rasputin ate several of the pastries and seemed to enjoy it. He drank some wine. Nothing happened to him. His assassins watched and waited for hours. Rasputin was completely enjoying himself and showed no ill effects whatsoever from the massive dose of poison. Finally, after distracting Rasputin by pointing to a crucifix, a noble shot him point-blank. Rasputin fell to the floor and appeared to die. His assassins left him there. But later, when one returned to make sure Rasputin was dead, he sprung to his feet and began choking his assassin. Then Rasputin ran out, promising to tell the czarina. The assassins shot him again and again, and then beat him with a dumbbell, and he still was not dead. Then they tied him up and tossed him into the half-frozen river. He eventually died from drowning, on Dec. 17, 1916. This page was last modified on 19 July 2009, at 19:52.